A young nursing calf needs access to solid feed and water almost from birth. Photo courtesy of Karla Jenkins. 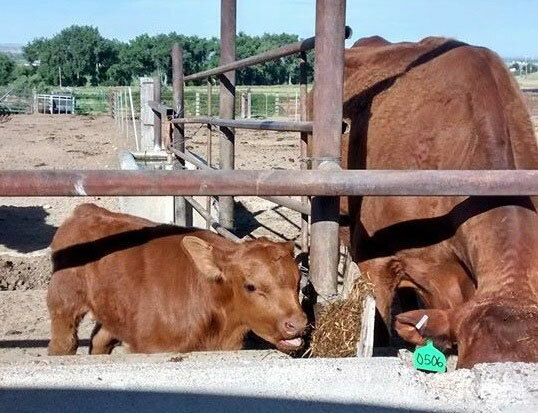 As grass leases continue to get harder to find and more expensive to acquire, and drought continues to threaten the Great Plains, cow/calf producers are showing more and more interest in feeding pairs in a confinement system. Research has shown that production cows can be maintained on a limit fed, energy dense diet when it is formulated to meet their nutritional needs. Limit feeding a diet based on poor quality hay or residue and nutrient dense by-products is usually the most inexpensive way to maintain cows in confinement. However, when limit feeding lactating cows there will be competition to finish the feed between cows. This makes having forage available for the nursing calf challenging unless feed can be available in a location inaccessible to the cows. A young nursing calf needs access to solid feed and water almost from birth. At less than a month of age, calves can be observed nibbling at grass or feed on the edge of the cow’s bunk. Solid feed and water are important to develop rumen function because milk, when suckled, bypasses the rumen via the closed esophageal groove and enters the abomasum. This provides highly digestible nutrients for skeletal and muscle growth at the tissue level. However, the rumen must begin developing soon so that solid foods can be digested there. When lactating cows are maintained on a limit fed diet in confinement, producers should consider developing a pen area only accessible to calves by removing bottom bars from a cross fence into an adjacent pen so the calves can access a feed bunk only available to them, providing a creep feeder, or allowing creep grazing of highly digestible forage. Highly digestible feeds such as high quality forages and by-products have a rapid passage rate through the rumen, which encourages dry matter intake and helps develop the small rumen of the nursing calf. Calves will likely continue to approach the bunk with their mothers when feed is delivered to the cows, but they may not be able to access enough of this feed to support the growth and development of their grazing counterparts without additional feed resources unavailable to the cows. Water is also a very important nutrient for the young nursing calf providing hydration as well as promoting rumen development. A common misconception is that the water in milk will provide all the hydration a calf needs. This is incorrect, particularly in the summer. Calves raised in confinement will need access to a water source they can reach and that refills quickly if cows drink the tank to a level below the calf’s ability to reach. Observe calves at the tank and modify the tank or provide a water source away from the cows if necessary to ensure calves receive adequate water intake. A source of shade may also be necessary if the young nursing calf is housed on a dirt surface during times of high temperatures. Providing a separate source of feed, water, and shade for the confined nursing calf can help set the calf up for success post-weaning. Producers wanting assistance with confined cow and calf rations should contact Nebraska Extension personnel.